I recently ran across two pictures that vividly illustrated one of the fundamental principles revealed in the Scriptures — namely, the sovereignty of God. The first was a painting by Pat Marvenko Smith, the remarkable illustrator of the book of Revelation. 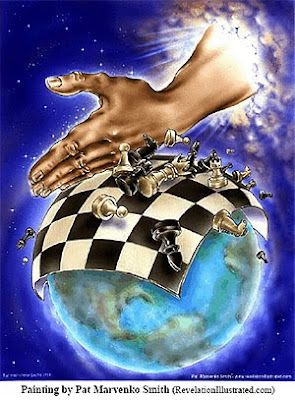 It showed the hand of God reaching down from Heaven to knock the playing pieces off a chessboard spread across the surface of the earth. It reminded me of how God so often intervenes in history to summarily dismiss the best laid plans of political leaders. He is able to confuse, frustrate and defeat the goals of the most powerful kings, presidents and prime ministers. The other picture was an editorial cartoon by the insightful Israeli artist, Oleg Schwartzburg. It showed Israel's Prime Minister, Benjamin Netanyahu, involved in a tug of war with several leaders of the world's superpowers. They are pulling mightily and sweating profusely while Netanyahu, standing alone, easily resists their pull, all because the finger of God rests on his end of the rope! It cleverly illustrates the only explanation possible for the continued existence of Israel since 1948, through war after war. How else can you explain the survival of less than two million Jews in the midst of a sea of Arabs exceeding 300 million in number? Psalm 103:19 — "The Lord has established His throne in the heavens; and His sovereignty rules over all." Psalm 135:5-6 — "I know the Lord is great, and that our Lord is above all gods. Whatever the Lord pleases, He does." Do you remember when the king of Babylon, Nebuchadnezzar, was rendered insane and lived like an animal for seven years, crawling around in fields eating grass? Daniel wrote that this whole experience was for the purpose of impressing upon the king "that the Most High is ruler over the realm of mankind, and bestows it [dominion] on whomever He wishes." (Daniel 4:32). Later, when Nebuchadnezzar regained his senses, he proclaimed the sovereignty of God: "All the inhabitants of the earth are accounted as nothing, but He [God] does according to His will in the host of heaven and among the inhabitants of earth ..." (Daniel 4:35). The hand of God can be upon someone in either a good or a bad sense. King David mentioned the positive aspect when he prayed, "...in Your hand is power and might; and it lies in Your hand to make great, and to strengthen everyone" (1 Chronicles 29:12). But the magicians of Pharaoh, in response to the third plague of gnats, bemoaned, "This is the finger of God" (Exodus 8:19). Every time things appear to be getting out of control on the world scene, and the bad guys appear to be getting the upper hand, I remind myself of Psalm 2. That psalm declares that while all the political leaders of the world conspire against the Lord and His Messiah, God sits in the heavens and laughs! He laughs not because He doesn't care. He cares intensely. He laughs because He has it all under control (see Psalm 2:1-5). In short, Almighty God has the wisdom and the power to orchestrate all the evil of Mankind to the triumph of His Son. We believers are in good hands, and because of that, we are going to win in the end! It is always good to be reminded that nothing happens without The Lord's sanction! My 'D' day (dedication of grand-daughter) is drawing close (13th June); and I am a little 'jumpy' with that and with decorating the cake. I have to keep telling myself that even this minor event is under His control. This may be a silly question, but should I eat with these deceived people? I don't HAVE to as it is a buffet and I can busy myself serving and clearing. E.I., I'd imagine anything that looks like it's causing a stir would be perceived by your family as a negative mark on the joyous occassion. A rift would then occur which would hurt the fostering relationship that you're trying so hard to build so that you still have the "in" in influencing them towards doctrinal soundness. We expect a little fiestiness from our favorite British mum, but I'd counsel you to not rock the boat. There's other better strategic opportunities for that. Of course, if they have you putting your hands in the dirt and saying that John 3:16 is about ecology (as Brian McLaren did), then politely obstaining would be an obligation. Look at it this way: We're all deceived in one way or another (in other words, we all have a lot to unlearn and relearn about our God), so just consider yourself in good company, steer the conversation away from potentially volatile topics, and love love love these people exactly where they're at! After all, that's what God is doing to us. Remember: Agreement is nice when it happens, but it's not a necessary ingredient for love! "...and with decorating the cake...should I eat with these..."
Wasn't it someone [in]famous over on your side of the pond that once said "Let them eat cake!" Enjoy! I agree. Don't rock the 'family boat'. After all, it's not like you're sharing the Lord's Supper with them... That would be another issue all together. Si lo desean, pueden leer la versión en español de este artículo en el enlace adjunto. Que el Señor les bendiga. You ar right, one thing for certain is my family will be watching me very closely. They were terrified when at a wedding in the CofE; a relative of the bride read from the scripture, but it was from the KORAN. I managed to hold it together, but even the vicar was frightened by my gasp and the shocked look on my face. He said “Hm, lovely, now lets read from the real Scripture 1Cor.13”. I have to admit I would never make the diplomatic corps. You are so right. It is something I would advise if I wasn’t the one needing the advice – if you know what I mean? I must add love, love, love to ‘be gracious’. “The Lord’s Supper”! Is that what that Scripture refers to Doc? My neighbours are Exclusive Brethren! They interpret it to mean ANY meal; I have always wondered about it and have never been too sure. Thank you and God bless you all, it really, really has helped. I wondered if Donald was addressing me so I had it translated. EI, that was a retorical '??'... But she never said it. It was a vicious attribution by the Masonic-Illuminati led revolutionaries. I just threw 'your side of the pond' out there 'cause the Brits & the French have always been pretty much joined at the hip...except the French are much more stuffy about 'protecting' their strange language cause they're still on the learning curve of trying to figger out the 'actual' sounds, and where to correctly use the other half of the alphabet that they throw willy-nilly into words! Somebody can explain me these. There a sector in the Judaism that they are not zionist and don't like the idea of the current status of the nation of the Israel becuase they said is man made and they are saying they are waiting for God to give their land and they are not going to to take the land out the palestinians. They are Ortodox Jews. They don't like violence. The courios thing nobody pay attention to them. Please somebody could explain that please. Dense I am! I thought it was a Q ‘Wasn’t it someone –“ but no Q mark present I see. I had heard ‘eat cake’ was a myth, but I assumed you thought it real, so didn’t want to be a ‘know it all’. Joined at the hip with France??? You jest – you do dontcha? As for the language, I can cook in it. I think you refer to the Orthodox Jews; the one’s who wear long side curls, wear black and trilby type hats? I don’t think I can add much more to what you have said. They spend most of their time studying the Torah and will not fight in the army. Their form of Judaism is not the original of the Bible, and they follow ‘kabala’, which is occult mysticism, not at all like the teaching of Moses. They believe that the Messiah will build the new Temple when he returns (not Jesus) so they do not support the Temple Mount faithful who are trying to get it rebuilt. They also harass the Messianic Jews. Sorry, that’s about all I know. "Zionism" vs. True Israel and the Jews is a real nasty 'can of worms' for Jews, Gentiles, and Christians alike! Although they are a very small minority, most "Torah Jews against Zionism" do know the real differences, dangers and the occultic origins of Zionists, a small but influential, key sub-group within the Globalist, Illuminati-New World Order. And like any group that has discovered some level of truth [Torah Jews still have the veil over their eyes], you are going to find that they also have factions and extremist fringe groups inflamed by 'agents provocateurs' and Disinfo-meisters to misdirect, embarrass and hinder them. Here is where Christians should shine the light of truth and make a difference, yet because the enemy works both ends against the middle with neo-Nazis, skin-heads, "Christian" Identity groups, Black Muslims [here], Muslims worldwide, and the like on one side, laying the global conspiracy at the feet all Jews, and the ACLU, ADL, Southern Poverty Law Center, Militia Watch, etc. on the other, with accusations of anti-semitism, racism, and conspiratorial paranoia, the majority of Christians are just plain gun-shy and drop out without ever cracking open a history book and discovering the difference. And again, there are many Pro-Israel Christians, who know that, although they are currently supporting secular Israel, they know the prophecies and look forward to the Restoration, yet mistakenly refer to themselves as 'Christian Zionists' without understanding the history of who and what 'Zionists' really are! From our vantage point, because the Torah Jews don't accept Jesus and the NT, they miss the magnitude of God's foreordination. With them, everything is cut and dry; "Secular Zionism is evil and it's taking us in the wrong direction -- to our destruction, but when Messiah returns He'll set it right..." They are unable to see that Genesis 50:20 "But as for you, you thought evil against me; but God meant it unto good, to bring to pass, as it is this day, to save much people alive." was not just for back then, but it is in full force for the current events of our time, and for all time, Gen. 1:1 to Rev. 22:21! They cannot see that in even the most vile machinations of Satan and his minions on earth, in persecuting and expelling Jews from all over the globe into one place, secular Israel, for easy destruction and the gathering the nations against them, has all been foreordained by the Holy One of Israel, as a wise farmer, according to his careful map, guides his brute ox, which has no comprehension of what he is pulling, nor of the field he is plowing and preparing for a planting and a great harvest. "The Lord’s Supper"! Is that what that Scripture refers to Doc? "Where Did We Ever Get the Notion that the Elements of the Lord's Supper Constitute a Supper"
I ran across this a few yrs back, got caught by the title, and it turned out to be a real surprise blessing -- a fresh perspective that makes you look forward to celebrating the Passover Feast. For the most part, it's a straight-forward read, intensive series, and occasionally gets fairly technical [just to bring out the fullness]. When I finished the series, I formatted it in MS-Word, made a couple of double-sided copies on a single-sided printer [that was a real challenge...], put them in sheet protectors in a binder and gave them to my church for people to read. In some of our home groups it's still a topic of discussion when we have communion. "We do theology for you . . . so you don't hurt yourself"
“Of course, if they have you putting your hands in the dirt and saying that John 3:16 is about ecology (as Brian McLaren did)-”. I had to remind myself about this, as it reminded me of something I spoke to the J.W’s. about in my ‘anti-culting’ days. It is the error of confusing ‘earth with World. The earth Ge - arable land; as opposed to the sea or water or the heavens. The world Kosmos - is concerned with the arrangement or order – the inhabitants of the earth. John3:16,17 ‘For God so loved the World …’ i.e the inhabitants of the earth, not the soil itself. This is the Scripture I meant, I coudn't find it before. "But now I have written to you not to keep company with anyone named a brother, who is sexually immoral, or covetous, or an idolater, or a reviler, or a drunkard, or an extortioner--not even to eat with such a person". Mum had to have some eye examinations ready for a cataract operation which took quite a time in a very hot hospital! Afterward I took her out on a treat and I am now absolutely pooped! Your post is interesting, I have copied it to muse over when my brain is re-activated. Thanks again. No, seriously... Y'all have a long DNA-swapping history together! Richard the Lionheart was French - his mum was Eleanor of Aqualung [Aqueduct??] in southern France. Funny that he's so well beloved in England when he spoke very little English, didn't like the language, food, or the culture and spent most of his time in his French Duchy, or off on the Crusades. Well I can’t deny the DNA with the French; my hubby’s descended from Jewish Huguenots – I know; sounds bizarre! Yet it is also true of other European countries, in particular Germany. We are predominantly Japhethites, descended from Noah’s son Japheth – now that’s an interesting study. Perhaps it is the family link with France that gives them so much attitude against the English? They really do not like us, and I stress the English as opposed to the Scots Irish and Welsh. In fact the Breton area is closer to the original English than we are, and the language is remarkably akin to Welsh. When the Romans invaded, the original occupants of England left for the outer areas of the island; in particular Cornwall and Wales which is probably what’s behind them not liking us either? My own heritage is mongrel! A bit o this and a bit o that and a bit o t’other. My Dad’s family has a Scottish tartan and is responsible for my double barrelled maiden name; along with my three Christian names plus my married name I have six altogether – just call me Sue! So my mix is Celtic Scot’s via Norway, Anglo Saxon via the Viking’s, Welsh – Celt again and a direct Jewish link via the female line. It’s about all that marauding and pillaging I should think? Actually its little wonder most of earth’s population don’t like us. By the way, who in the dickens is ‘Rodney king of Los Angeles’? Is Rodders Spanish? The Brits are very particular when they call themselves "mongrel," aren't they? Here in the good ole USofA, a mongrel means being part British (all the islands are the same to us unless we're watching a Mel Gibson movie), Cherokee, Spanish/Aztec mix, with a little African blood thrown in there from some illicit owner/slave relationship - and that's just the South. You ought to see the mixes that come from the West Coast! I always pictured Richard the Lionheart as a Sean Connery character, fully British (yeah, I know, Connery is Scottish). Hope your mum pulled through the surgery aok, E.I. Rodney King was the subject of LAPD police brutality on March 3, 1991 after a high-speed DUI [and allegedly PCP] chase. A bystander, George Holliday, videotaped much of the incident from a distance. The footage showed LAPD officers repeatedly striking King with their batons. A portion of this footage was aired by news agencies around the world, causing public outrage that raised tensions between the black community and the LAPD. Four LAPD officers were tried and acquitted, which sparked the 1992 Los Angeles riots. When asked about it later he made his profound, timeless statement: "Can't we all just get along!" PS. Ooops, did I inadvertently get Jethro Tull somehow thrown into the mix?!? YES! Memory well and truly jogged - I do know of said gent. It was certainly in our News; it was really horrible poor chap. Can't crow, we have had similar with one (at least)of our Coppers. And my beautiful grandson wants to be one - shudder. Nathan, thank your for asking after my Mum. She only went through the tests the other day in preparation for the cateract op which is on 2nd June. One of the oddest things that I've noticed about parents is that they definitely seem to be hereditary. If you have 'em, chances are real strong that your children will be stuck with 'em too!